Audi isn't short of high performance cars in its range but there's one model that stands out above the rest - the RS4. Renowned for its performance and handling, it's a car that is admired as much as the BMW M3 and loved by motoring critics and owners alike. So there's certainly big anticipation for this new version. The surprise is that it only comes as an Avant. Not the usual body shape for a high performance motor, but Audi has form here. There was the epic V10-powered RS6 Avant from a few years ago and the previous RS4 came as an estate too. The reasoning for the lack of a saloon according to Audi is that it already has the RS5 which is powered by the same engine. And that engine is a monstrous 4.0-litre V8 which produces 450PS. 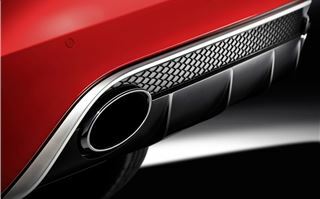 Surprise number two here is that unlike the recently launched S6 and S7 Sportback it's not turbocharged. Instead Audi has opted for a normally aspirated engine so the performance purists will be very pleased. However it does mean it's thirsty with a claimed average of 26.4mpg and if you're heavy with your right foot that will quickly plummet. However it looks positively economical compared to the old RS4 which only did 20.8mpg on a good day. 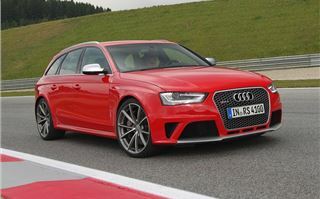 But you won't be shocked to discover that the RS4 is very quick. It will rocket from 0-62mph in just 4.7 seconds helped by a launch control system which comes as standard. You simply hold the brake with your left foot, put the accelerator pedal to the floor and release the brake. The on board clever stuff then maximises traction and acceleration. 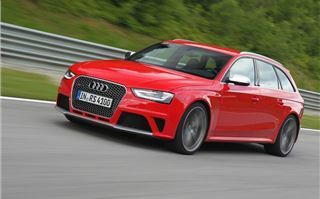 As you'd expect from a high performance Audi, the new RS4 gets quattro four-wheel drive as standard. As standard it directs 60% power to the rear wheels but it can increase this to 80% depending on the conditions. With all that power the extra traction certainly gives you more reassurance, especially in the wet, so accelerating out of slow corners feels much more stable than in a rear-wheel drive. Remember that neither BMW nor Mercedes-Benz offer four-wheel drive in their equivalent performance models. There's also a torque vectoring system which works with the self locking centre differential. This gently brakes the inside wheel in corners, making the RS4 incredibly precise in bends and requiring less steering input. The sheer grip from those wide tyres is immense and despite it's considerable size, the Audi is agile and responds well to quick changes in direction. Rarely does it become unruly. What might not please the purists is that the RS4 comes with an S tronic gearbox as standard. There's no manual 'box available and Audi says there won't be either. Is that an issue? Well the S tronic does work very well with the big V8 engine and makes the RS4 useable in traffic and in town. You can leave it in D and it will happily potter along at low speeds. It's when you're pushing a bit harder that you might miss the interaction and enjoyment of a manual. However you can shift using the paddles on the steering wheel and in Dynamic mode it will hold the revs at the red line rather than automatically changing up. 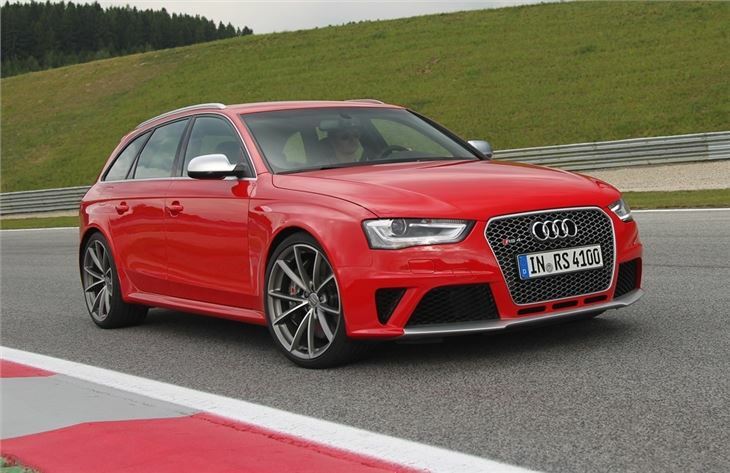 Without a turbocharger the RS4 doesn't have as much torque as the S6. That said with 430Nm it's hardly shy of pulling power but it does peak higher up the rev range than with a TFSI engine and so it doesn't feel as responsive low down as you'd expect. The acceleration is wonderfully smooth and linear though and that V8 sounds great too with a lovely low rumble on start up and a deep resonance when you're on the move. Surprise number three is that the RS4 rides smoothly, particularly so for a performance car of this ilk. It's forgiving and comfortable which means it's a car you can live with everyday without ruining your spine. There's the Audi Drive Select system which lets you choose between various setting from comfort to dynamic and if you pay extra for the Dynamic Ride Control system it also alters the ride settings so you can go for softer on rough roads. The standard sports seats are finished in leather and Alcantara and offer good support but there are optional bucket seats available which are even better and look great too. The rest of the interior is everything you'd expect from Audi with a high class finish and a real feeling of quality throughout. To make it stand out the RS4 gets a thick rimmed steering wheel with a flat bottom and a carbon fibre effect trim on the doors and central console. Prices start at £54,925 which is more than competitive alongside the Mercedes C63 AMG and BMW M3, especially when the Audi gets an automatic gearbox and four-wheel drive as standard. You can order one now and the first cars will arrive in October. It's well equipped too with sat nav, Bluetooth and xenon headlights as standard. There's some good options too including ceramic brakes, a Bang & Olufsen sound system and a sports exhaust with black tailpipes. The RS4 is a hugely capable and impressive car that it's difficult to find fault with. It does everything superbly well and ticks all the boxes as a high performance estate. However, it lacks that x factor that turns a great car into a superb one. It's difficult to put your finger on what's missing but ultimately it's not as exciting nor as fun as you'd hope an RS4 would be. While it's more refined and more advanced the RS4 has lost that raw edge that made its predecessor so revered. You can't help but wish it was a bit noisier, a bit firmer and a bit more of a brute.